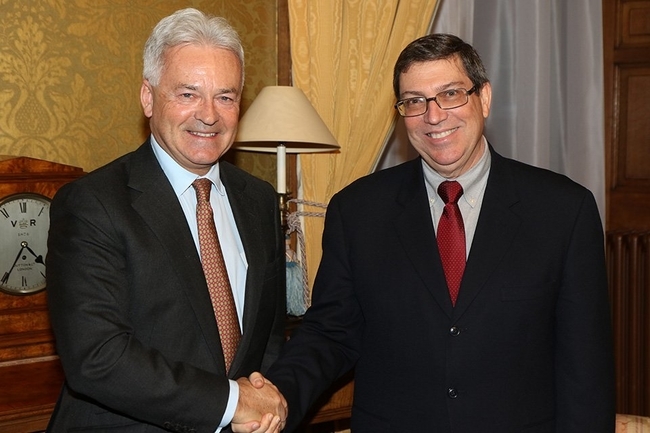 Sir Alan Duncan MP, Minister of State for Europe and the Americas, has again made clear the British Government’s opposition to United States extraterritorial blockade policies against Cuba. In a welcome development, his statement to Parliament (22 January 2019) spells out that UK companies will be acting illegally if they ‘comply with extraterritorial legislation such as the US embargo’. In a response to a parliamentary question from David Davies MP, Mr Duncan made clear that any British company that complied with the US legislation would be acting ‘illegally’ under the UK Protection of Trading Interests Act 1980. ‘This is a very important and welcome statement from Sir Alan Duncan MP. It clarifies the point that we have been making for many years, that there is already UK legislation on statute to counteract the United States extraterritorial bullying of British companies wanting to trade perfectly legally with Cuba. We now very much hope that the Government will act on these words and make use of such legislation to take legal action against any company or organisation that carries out US anti Cuba policies in the UK’. In 2016, the Co-operative Bank closed the accounts of the Cuba Solidarity Campaign, and in 2017 the Open University banned applications from Cuban students. Both cited US blockade policies for their actions. ‘The Open University and the Co-operative Bank alongside many other UK companies have acquiesced to US threats over many years and carried out US anti Cuban policies in Britain. The Government should have acted against these companies at the time. We hope that in the future the Government will uphold its own laws and turn its words into real actions to protect British sovereignty from the threats from the United States which seems to think it is fine to interfere in our national trading interests’. The UK Government statement comes just days after the US government suspended Title III of the Helms-Burton legislation (January 16) for just 45 days, raising real fears of a new aggression against Cuba. Title III is the part of the Helms-Burton Act which gives US citizens the right to sue foreign companies for using properties which were nationalised following the Cuban Revolution in 1959. However, while the US strictly adheres to other articles of Helms-Burton (an Act which codified sanctions against Cuba into US law 23 years ago), Title III has never been enforced. Every president, Democrat and Republican, has waived this part of the Act on a six-monthly basis since it was passed in 1996. In reducing the waiver period to just 45 days, the US government is sending a warning to the international community that anyone with investments in Cuba may be about to get dragged through the US courts. Such a move would scupper any further development of UK trade with the island. In reponse to the US statement on Title III, Karen Lee MP rasied a written question in the House of Commons on 29 January. The Lincoln MP and chair of the All Party Group on Cuba asked the Sectretary of State for International Trade, "what plans he has to support British companies that trade with Cuba in the event of the United States lifting the suspension of Title III of the Helms-Burton legislation." "We oppose the US embargo on the grounds of its damaging impact on the Cuban economy, its counterproductive effect in achieving positive change inCuba, and the negative extra-territorial effects that it has on UK business. We oppose any possible tightening in the future for these reasons. "The EU and UK have already passed legislation – the EU Regulation 2271/96 (“The EU Blocking Regulation”) and the Extraterritorial US Legislation (Sanctions against Cuba, Iran and Libya) (Protection of Trading Interests) Order 1996 that makes it illegal to comply with the extraterritorial effects of the embargo. We will continue to work together with our EU partners to provide UK companies with the support they need to be able to trade with Cuba. Officials in London and the British Embassy in Havana provide a range of bespoke assistance to companies and regularly raise our objections to trade restrictions on Cuba with US counterparts."